My little guy turned 5 in August, so even though I would not have sent him to school this year, if we were going that route, we've done some kindergarten work. Overall, it has not been going well. He doesn't want to sit still, and has strong opinions about whether or not he should have to do any school work at all. 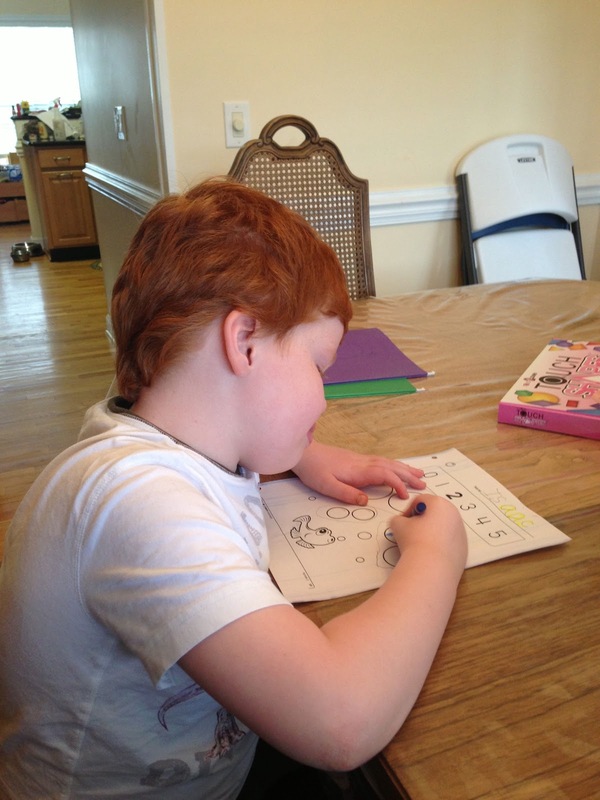 It's not that he can't do it; he's quick to grasp things, and once he decides to cooperate, it goes quickly. I do spend quite a lot more time getting him to do the actual work than he spends doing it, though. I've been revising my plan over the last few weeks, and felt it was best to pare back to some reading instruction and a little math. When the opportunity came to review TouchMath, I was excited to use it with Isaac. We were both thrilled to receive our box, and quickly got everything out to play. 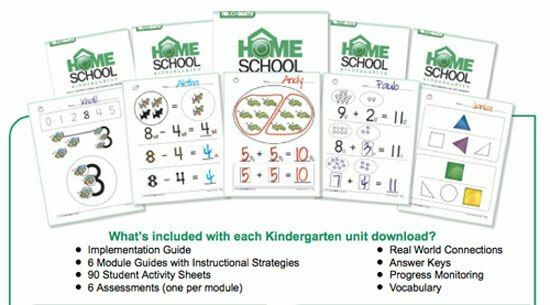 For the purpose of this review, I received downloadable versions of all 4 TouchMath Kindergarten Homeschool modules, A-D. There are 6 units within each module. Module D focuses on measurement, data, and geometry. and 3-D Numerals. 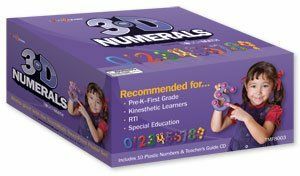 Note: The manipulatives are optional, and not required to use the program. Isaac *loved* all the manipulatives. We started out with learning the touch points on the numbers, and he caught on quickly. He liked to get them out and practice on his own. He enjoyed using the TouchShapes during the lessons, and liked using them to make pictures on his own. He's always up for a game on the computer, and he liked having a special math game just for him. "Mommy, is this a rhombus or a hexagon? Very good, Mommy!" One of the first things we did was learn to count to 100. I remember practicing this with my girls when they were older than Isaac, so I wasn't sure how it would go, but he caught on lickety-split. I loved how the worksheets had him start counting in a random place and continue from there, or fill in numbers in the middle of a sequence. It made him think about the numbers, and he did very well. 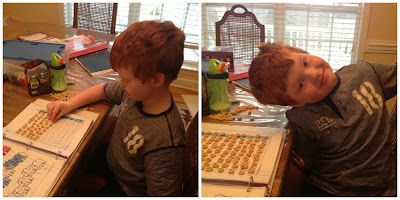 Counting to 100 - fun with Cheerios! As we got a little further, I thought some of the activities were a bit simple. I didn't see why he needed to circle groups of shapes, for example, until I remembered from the teacher training video how crucial it is to connect manipulatives and pictures with the abstract numbers. By circling groups of 2, he is learning to see what a "2" means. 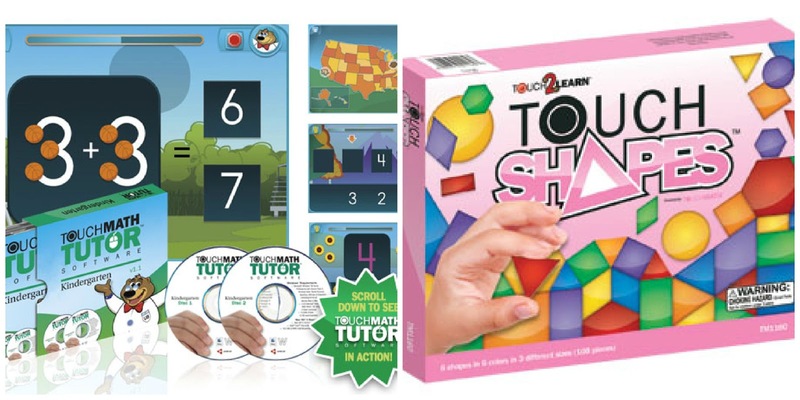 TouchMath recommends using the program for 2 - 2.5 times your child's age, which would be 10-12 minutes per day for my 5-year-old. On a typical day, we would try to work on a set of activity sheets, which were in sets of 2-4 pages in the Implementation Guide. Sometimes, we got them all done, and other times, we might get through one. He liked the computer software, so I encouraged him to practice on that, and he was almost always willing. As we began to use the program, I was concerned that I was missing something. I had read the teacher's instructions, but didn't feel I had quite enough information. I confess that I am an anxious math teacher. I went to the website and ordered their free teacher training DVD, even though I wasn't sure I'd get it in time for the review. It arrived via Priority Mail in just a couple of days! I was thrilled with the quick turnaround. I watched the DVD, and it was very helpful. They also included a "Teacher Training Manual," with much of the information presented in it, and practice problems for each thing presented. It was excellent, and I felt much more confident after I'd viewed it. I have been impressed with their excellent customer service. I had a question about the software, and was able to get an answer quickly. Also, we had an issue with one of our manipulatives, and they sent us another one right away free of charge. I really, really like this program. I love the statements that children are given to memorize, like "I start on the side with the arrow. The arrow is in the ones column on the right side." Also, for addition with regrouping, they put a box over the next column, and for subtraction, they use a "regrouping bar," which is a line, instead. My girls were often confused with regrouping and would add instead of subtract, etc. Those visual cues are excellent. TouchMath was created because an elementary teacher saw her beginning math students having difficulty, and wanted to help them. The focus was initially on students with special needs, but has grown into a math program for anyone. I love this quote from their website: "During the next thirty years, our goal is to help banish math anxiety worldwide, whether that anxiety is born of fear, lack of comprehension, or a learning disability." I have a daughter with quite a lot of math anxiety, and I wish I'd known about this program when we were starting our math journey. I think it would have made a huge difference to her. I've spent a lot of time stressing over math in my homeschooling career, and while using TouchMath, I felt I could teach it successfully for the first time. The way they explained the concepts made so much sense to me, which made it easy to explain to Isaac. I was amazed at how quickly he learned things while using this program.